This incredible home is secluded in a 24 hour guard gated oceanfront community, yet is close to all that Kona has to offer. It is located just a short walk from the classic old Hawaiian town of Kailua and the start/finish of the Ironman. In all of Kona, there are only around half a dozen homes that enjoy a setting on a sandy beach (all the rest have rocky shoreline). Kona Bay Bliss is one of these few special homes. 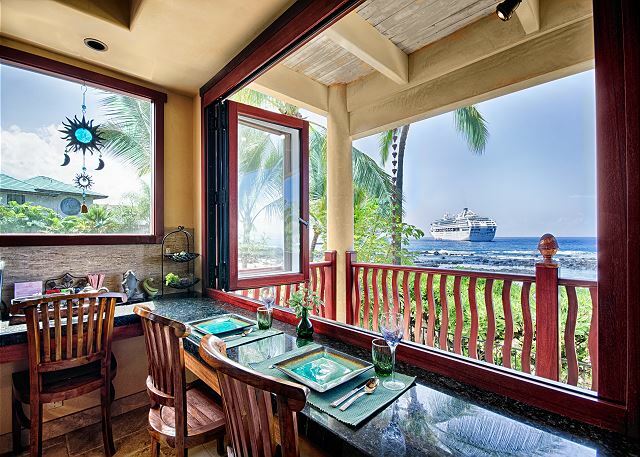 Kona Bay Bliss recently went through an extensive remodel and upgrade. The home has four bedrooms including an incredible air conditioned master suite with a private lanai and stunning ocean views, double slipper clawfoot tub, steam shower for two, office and workout room. Enjoy a relaxing morning on our sandy beachfront lounge chairs (no need to pack up and go to the beach - you are already there), take a dip in the ocean, wash the salt off with our heated outdoor shower, fix a refreshing lunch in our covered outdoor BBQ kitchen and serve it to your friends at the swim up pool bar. For dinner, imagine cooking in our gourmet kitchen with Bosch appliances. 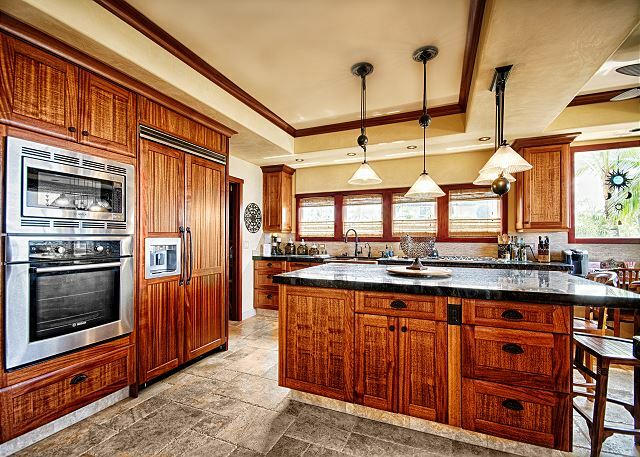 No expense has been spared outfitting this kitchen for the gourmet chef in your party. Prepare your food on our granite counter tops, wash your dishes using our state of the art double drawer Fisher and Paykel dishwasher after rinsing them in the double bowl solid copper farmhouse sink. All four bedrooms are air conditioned, furnished with quality furnishings and have their own private attached bathrooms with showers. Pick out a movie from our library of Blu-ray videos and watch it with your friends in our air conditioned home theater on an 80 inch screen. Can't find a movie in our extensive library of DVDs? No problem, just press the Netflix button on the smart remote and choose something from their vast library. Don't want to watch TV? No problem, pick out a book from our well stocked library and reading room. End your day with a color light show and soothing dip in our 8 person spa. 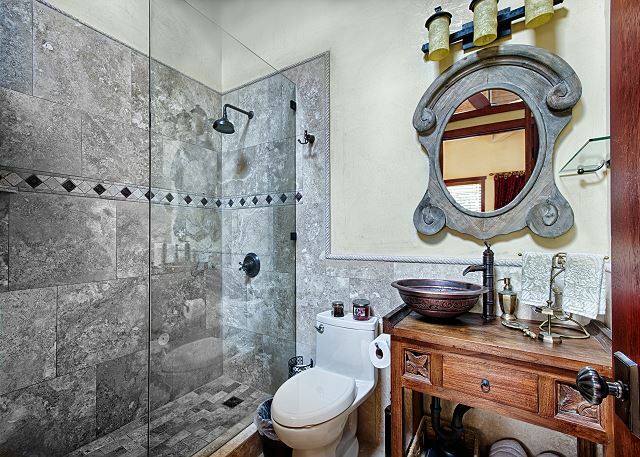 No expense has been spared in preparing this home for you. 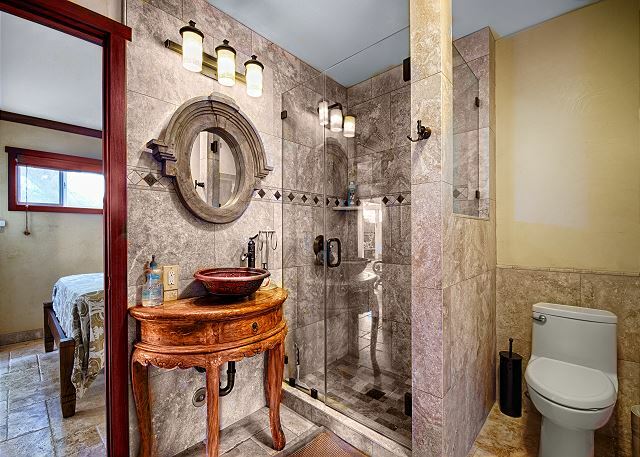 This is truly one of the finest vacation rental homes in all of Hawaii. Up the coast is a busy marina with Hawaii's best scuba diving, big-game fishing, kayaking, dolphin and whale watching and other ocean activities. 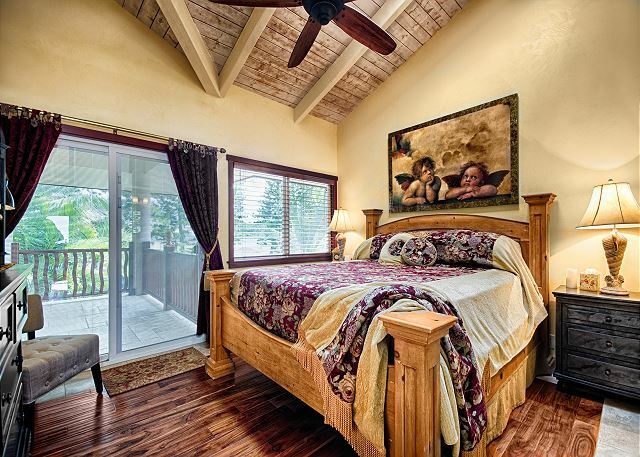 This home is conveniently located, and a great home base to explore the many wonders of the Big Island including the Volcano National Park, Mauna Kea Observatory, coffee and macadamia nut farms, artist communities, and more! We stayed....two families with 3 15-year-old boys for a week in March. The house worked perfectly for us. The "Queen's Bath" the ocean pool just outside the house was lovely and a great place to swim around, look at fish and crabs and urchins, and just generally relax. A lovely small white sand beach. The house itself (Kona Bay Bliss) was great. Super clean and comfortable. The beds were great, and I am super picky. The house and kitchen were very well stocked with everything we could want. The pool was a main focus for our boys - as well as our old selves. And the hot tub was lovely. We honestly didn't have any issues, so did not need to reach out to management, which is a great thing! There is not air-conditioning, which might be a factor in hot summer months. This is a beautiful and clearly much-loved home. We enjoyed our week in paradise immensely! 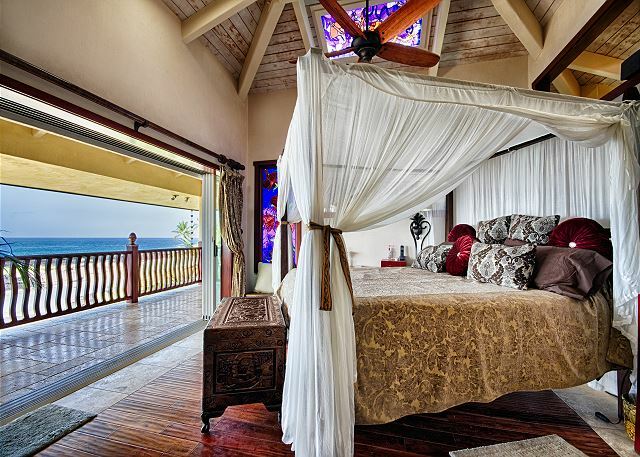 Mahalo nui loa, for your genuine and personal review of the Kona Bay Bliss home. We are delighted with your 5 star review and very much hope you return with your two families. Please do contact our attentive property manager, Nick, for our coveted repeat visitor rates which are the best you can access. We had such a wonderful time at Kona Bay Bliss. This is our second time staying here and we decided this year, we’re coming back every year. The new owners added some really nice personal touches. The kids room was filled with mermaids and flip sequence pillows. My six year old daughter was in heaven. We spent mornings tide looking and sipping coffe on the Landis with George pics and endless views. Walking distance to town and across the street was a huge field and awesome park/playground. We had a one year old with us as well and even though there are stairs, she was safe with the baby gates that were provided. Can’t wait to come back!!!! Thank you for posting this 5 star review of your experience at Kona Bay Bliss. We are thrilled to hear you had a beautiful stay at this fabulous location enjoying the personal touches. We look forward to your next stay with us, mahalo nui loa! Very Special property with lots of life time memories made. 11 family members had a vacation to remember. We've been spoiled for the rest of our lives. This place had everything you could want or desire in a home. The most well equipped we have ever stayed in. Location was perfect and we stayed around the property most of the time. Nick went the extra mile in taking care of us. As a family, we have not gone back to a property, but to a person, they want to come back to Kpna Bliss. Thank you for posting this 5 star review of your experience at Kona Bay Bliss! We are overjoyed to hear you feel like you have been spoiled for the rest of your lives after your beautiful stay at the exquisitely located Kona Bay Bliss. Mahalo nui loa! We very much hope you and your family return. The house was amazing. We loved to wake up and have our coffee looking out at the ocean and spending our evenings in the hot tub or playing volley ball in the pool with one of the pool balls. We even snorkeled with a sea turtle right in front of the house. on the decks and tons of time in the pool and hot tub. Rare unique small beach and lagoon made this even better! We didn’t realize when we booked how lucky we were with our choice, the location is perfect !! 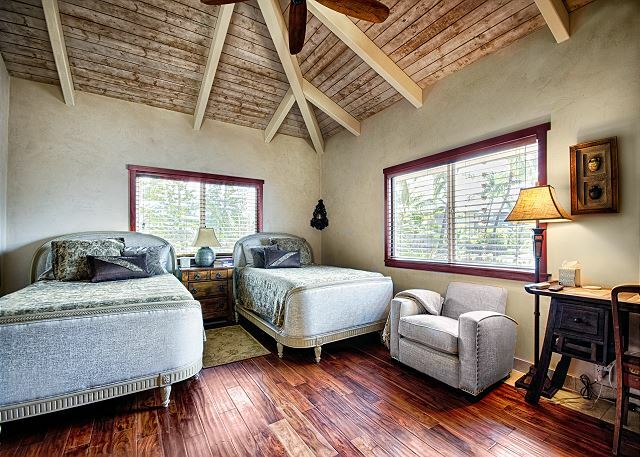 This home is truly unique and you're right it is extremely rare to find a home in Kona with direct beach access. We're happy to hear you have enjoy every facet of the home and encourage you to return! This property was perfect for our multi-generational family group. 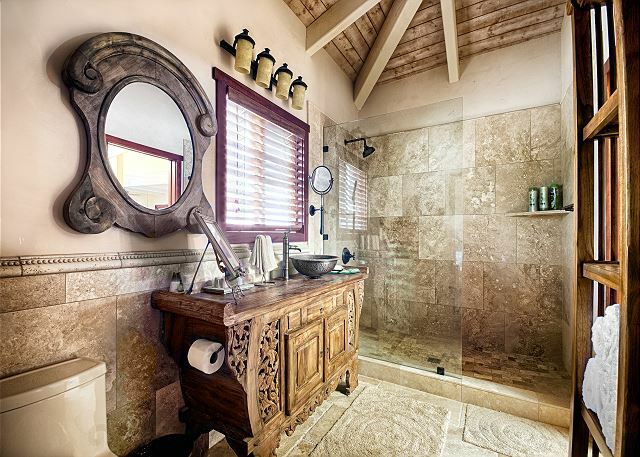 Every bedroom has an ensuite with large tile and glass shower, the top floor master suite is incredible with great views, the kitchen is large, well appointed and has everything you need, there is a great pool and attached spa pool, with BBQ and swim up bar! The common area walls open to a great lanai overlooking the beach, where we relaxed and watched the cruise ships in port. The grounds and gated community are groomed and beautiful, there is 24 hour security, not intrusive, but paying attention, and it’s only a short 15 minute walk to the centre of the action in Kailua-Kona. And to top it off the property is right on the beautiful picturesque white sand Keiki Beach with a sand bottom tidal pool that was perfect for our toddler grandkids to splash in and yet large and deep enough for the adults to swim in the clear warm waters. There were crabs, starfish, tropical fish swimming through and over the rocks around the edges. And all the beach and pool toys, chairs, umbrellas, and snorkel gear were there for our use. Over 2 weeks of high season we never saw more than 50 people using the beach area, on a Sunday. Otherwise never more than 25. Luxury in a perfect location. Howard, I don't I could have described the property better myself! What wonderful imagery you've used here, we thank you for your detailed review of Kona Bay Bliss. Hope to see you again soon! All great except the ice maker was broken and we had to buy ice. Otherwise, great home! Dr. Williams I sincerely hope this small maintenance issue didn't take away from the vacation. We are in the process of resolving the issue however our location in the middle of the Pacific ocean puts us at a slight disadvantage to acquire the necessary parts. Mahalo for your understanding and we hope to make it up to you in your future visits to the Big Island! We walked in and could not believe the view. The location could not be better. We were within walking distance to Kona. And the house was huge and had plenty of room for all 10 of us. We will be back. Thank you for sharing your beautiful home and beachfront property with us!! It was the perfect stage as I celebrated my 60th Birthday with Freinds. The dining area accommodated 16 dinner guests comfortably and the ocean view is right there as you listen to the waves close by. It was quiet and relaxing...steps away from the tide pool where you can swim and float..or just sit on the beach. Love this property and is highly recommended. Thank you for visiting with us! Please let us know when you return and we would be happy to extend a special discount on your next trip.